I get the impression that there might be other Imperial splinter factions. I wonder what they might be like, if the First Order is the worst among them? The Empire may be seen like the Soviet Union was during the cold war (heh "evil empire" as it were). The First Order may well be a proxy for the Empire like the Resistance seems to be for the New Republic. Very timely politics, that woild be. According to some of the recent novels and comics, the Empire resisted the New Republic until the Battle of Jakku, where they suffer a decisive defeat. The Empire is forced to negotiate a peace with the New Republic, where they lose claim to Coruscant, and their fleet is confined to specific areas. Some commanders don't accept this and end up fleeing to parts unknown, presumably forming the First Order. I liked the movie by and large, definitely, will see it again soon, but I thought they totally squandered the dramatic potential of the Starkiller attack on the Republic political capital and its fleet, because it was not made clear that they were attacking them, it was just inferred from Hux's speech. It felt very glossed over, at first watch I just assumed the planets hit were two random worlds aligned with the New Republic, and that this was a little show of force, with the capital and the fleet targeted later. The idea that the capital of the republic and all its official fleet was destroyed in under a minute, and not one pilot, officer, or other resistance member even batted an eye or apparently knew anyone back there, it totally squandered the potential of the moment for me. The people in the rebel base should have been breaking down, sliding down on the floor, crying, despairing, being furious. This was an astounding defeat for the resistance and it should have plagued the entire rest of the movie so that no further move by the resistance in the short term (including the very anticlimactic Starkiller destruction) could come close to making up for losing three or four planets in the galactic core worlds. As it was, the narrative reaction and impact of the super-destruction seemed to be like if Italy would have scored from 3-2 to 3-3 against Britain in a world cup. Like, "well, now we need to work a bit harder, boys. Pip pip." The original Ep 4 was of course legendary in understatedness, with the explosion of Alderaan taking 0.75 seconds, instead of a drawn-out crumbling, and it wasn't set to tragic music and the muted screams of crowds (like the Brunnen-G in the LEXX pilot episode), and Leia was just like "Aww, no! ", she wasn't clawing at Vader or screaming hysterically, and when we next see her in her cell, she quips sardonically, instead of having been trying to slash her wrists with a crushed lamp shard. So with that as a meter, I guess the Starkiller crap attack was in line with the OT, like JJ Abrams wants everything else to be. And I like that sentiment. Especially with the OT-looking TFA saber duels, which were hard, static, brutal, and crude, not boring, endless, consequence-free kung fu duels where the participants slash at eachother 350 times and achieve nothing. Here we got goring and mutilation in short order, showing how nasty saber wounds are. 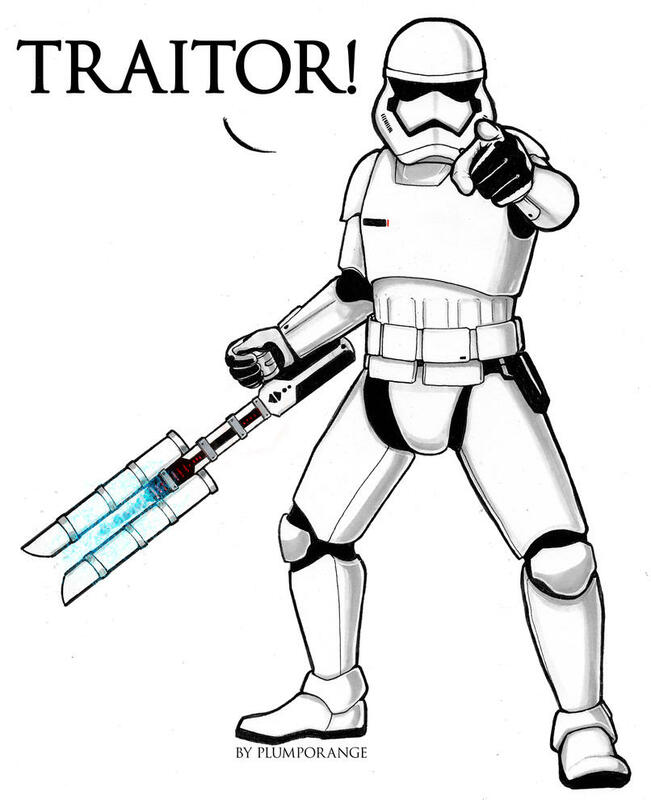 Gotta love TR-8R. Astounded that Phasma turned out to be a weakling chump that agrees to backstab her entire cause because a blaster was aimed at her. Hope she gets some restitution in Ep8. I was amazed that John Williams can still make new stuff, I love Rey's theme! The man is 84 years old and he's cranking out new Star Wars original themes that fit in with the OT. Bindmoggling. I'm betting she's a Resistance agent- her delivery is much closer to "this lame plan won't work" than "I'll spit on your grave". But then, it's possible the actress is just terrible. That would also be in keeping with the spirit of the OT. She's definitely not a terrible actress.